Front Row, from left: Ger Liddy, Anthony McNamara (Chairman), Paddy McNamara, Ray Ryan (Treasurer), Back row, from left: Tony Kirby, Joe Hayes, Robert Hickey, David Ryan, Bobby Duhig (Jnr. ), Dan Gallagher, Kevin Moloney, Timmy Kerley (Secretary), Pat Lysaght, Paul Manning, Jimmy Duhig and Seamus O'Cinneide, PRO. 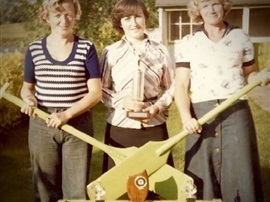 Abbey Regatta 1977 - Victorious Ladies Team: Marie Lysaght, Gretta Gallagher and Rosaleen Bolger. 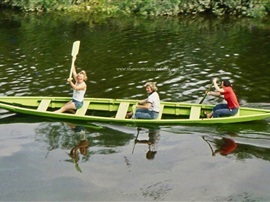 Abbey Regatta 1977 - Winners of the Ladies Paddly Race were: Marie Lysaght, Rosaleen Bolger and Gretta Gallagher. 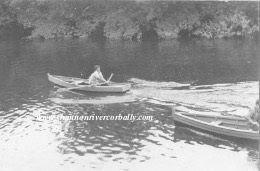 Pat Liston winner of the small Gandelow Race Abbey Regatta 1977. 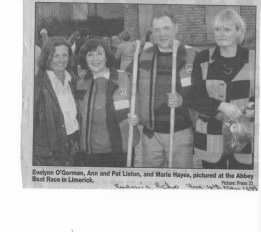 At the Abbey Race: Evelyn O'Gorman, Ann and Pat Liston and Marie Hayes.